刊名變更： The JCBS has had a long history rooted in the Chung-Hwa Institute of Buddhist Studies. It was previously known as the Chung-Hwa Buddhist Journal from 1987 to 2013. Prior to 1987, it was known as Hwakang Buddhist Journal, which published 8 issues until its name was replaced. In 2014, the Journal changed its name to The Journal of Chinese Buddhist Studies (JCBS). 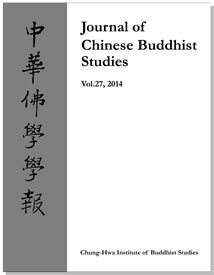 內容簡介： The Journal of Chinese Buddhist Studies (JCBS) is a scholarly journal dedicated to the historical study of Chinese Buddhism in the premodern and modern periods. It seeks to promote the academic study, and teaching, of all aspects of Buddhist thought, practice, social, and institutional life in China, including historical interactions with Buddhist developments in South, East, and Central Asia. The JCBS publishes annually, and meets in conjunction with the American Academy of Religion.